Over 80 years ago, York Barbell began shaping the fitness industry through product design, education, competition, and athletic sponsorship. Named “Father of World Weightlifting” by the International Weightlifting Federation, Bob Hoffman founded York Barbell in 1932 and immediately began pioneering many of today’s accepted exercise philosophies. As a prolific writer of books and articles, Hoffman tirelessly promoted the benefits of exercise successfully encouraging its practice to the military and the general public. Bob and his beloved York Barbell Company developed among the first lines of exercise equipment in the industry. A pioneer in the health food business, Hoffman introduced a line of nutritional supplements in the early 1950s and developed the first energy bar in 1966. From the decades of the 30’s through the 70’s, York Barbell flexed its muscle with its Olympic lifting teams. The renowned York Barbell Club dominated the Olympic scene with over 40 national championships and numerous Olympic Gold Medalists. 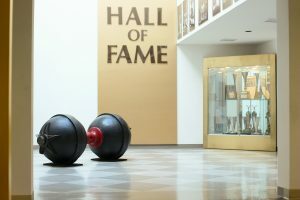 Today, the corporate office of York Barbell Company houses the official Weightlifting Hall of Fame and Museum in York, Pennsylvania. Through its long history, York Barbell revolutionized the design of training equipment and products. From the early glove barbell designs to today’s precision plates, innovative grip plates, finely crafted bar, and residential and commercial free weight equipment, York Barbell has consistently set the standard in product styling, performance, and value. Bob Hoffman was a pioneer in the use of physical conditioning and strength training. 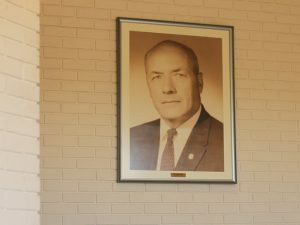 His life story and accomplishments are detailed in a section of the museum. The original York Barbell facility was an outgrowth of his oil burner business in York. Bob’s official weightlifting club produced a four-decade progression of world and Olympic weightlifting champions such as Bill Good, Joe Miller, Tony Terlazzo, John Terpak, Stan Stanczyk, John Davis, Pete George, and Tommy Kono. Bob Hoffman guided weight lifting activities during the mid 20th century through his philanthropy and public attention to the sport. The International Weightlifting Federation officially recognized his efforts by designating Bob “The Father of World Weightlifting” in 1970. Our corporate mission statement sums up our overall business philosophy. As the “Strongest Name in Fitness,” we will develop, manufacture and distribute quality strength and fitness products that enhance athletic performance and improve quality of life. We will surpass the expectations of our retail dealers and institutional accounts by providing world class professionalism and service.